Vodden, C. et al. "Geological Survey of Canada". The Canadian Encyclopedia, 19 November 2018, Historica Canada. https://www.thecanadianencyclopedia.ca/en/article/geological-survey-of-canada. Accessed 19 April 2019. The Geological Survey of Canada (GSC) is Canada's national agency for geoscientific information and research. It studies and reports on Canada’s geology, natural geological hazards, and the development of natural resources. Established in 1842 primarily to promote the mining industry, it is one of the country’s oldest scientific organizations. Throughout its history, the Survey has produced some of the most comprehensive and detailed maps of the Canadian landscape, and published several important reports on its ecology and natural history. 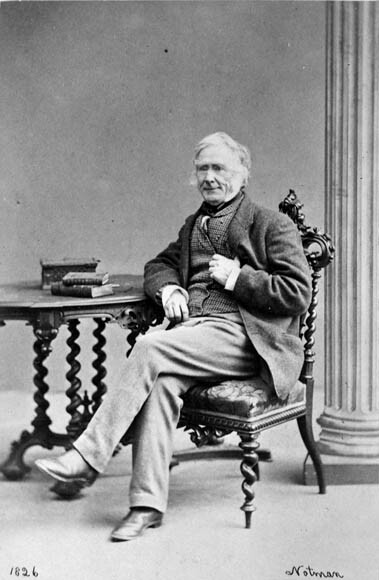 William Edmond Logan, founder and first director of the Geological Survey of Canada, c 1860-1870. In 1841, the government of the Province of Canada (the area that is now the southern parts of Ontario	and Québec) budgeted £1,500 to carry out a geological survey of the province. This made it among the early publicly funded geological surveys in the world, following the establishment of surveys in France, the US, Ireland, Scotland and Britain between 1823 and 1835. Zaslow’s observation applies equally to geological surveys throughout the world. But the historical significance of the Canadian Survey was distinct from many of its precursors because it was part of a broader project of promoting the settlement of the frontier by white subjects loyal to the British Crown. This attitude was demonstrated in the rhetoric of politicians such as Austin Cuvilliers, the speaker of the government’s Legislative Council, who in June 1841 stated that the government’s central objective was “the adoption of measures for developing the resources of the Province… The rapid settlement of the country,” he added, would be “deeply affected by this question.” In this context, the Survey can be viewed as one of many proactive, nation building measures undertaken by the colonial administration in the mid-19th century. In spite of the Survey’s colonial mandate, however, it is also true that most of its geologists throughout history have themselves been primarily interested in natural history. Many wrote on scientific subjects beyond geology, including geography, botany, zoology, and even anthropology. For instance, George Mercer Dawson, one of the first topographers of the Canadian Rockies, wrote ethnographic reports on the Haida	and Cree peoples, while at the same time surveying the west coast for coal deposits and charting the expansion of the Canadian Pacific Railway. The Geological Survey, in that sense, has a complex, historical legacy — on the one hand contributing to the natural and social sciences, and on the other contributing to the colonization of Indigenous lands and the exploitation of ecological resources. The Survey’s founder and first director, Montréal-born geologist William Edmond Logan, was appointed in April 1842, and established the Survey's headquarters in Montréal the following spring. Fieldwork began that year, with Logan working between Pictou, Nova Scotia, and Québec's Gaspé Peninsula, as well as the north shores of lakes Huron and Superior. His assistant, Alexander Murray, worked between Lakes Erie and Huron in Ontario. Rapid industrial advances in England since the late 18th century had relied heavily on coal mining, and the search for a Canadian supply was the Survey's first priority. Results of the first two field seasons showed that no coal deposits were to be found in what was then Canada, but the research did lay the scientific foundation for further exploration. The Survey's mandate was then renewed in March 1845. As the Survey took root, additional staff were hired, including chemist Thomas Sterry Hunt and paleontologist Elkanah Billings. By the late 1850s, the Survey was conducting topographical surveys, making maps, producing reports, and maintaining a public museum. In 1863, the Survey published the first comprehensive report on Canadian geology. This 983-page book and its hand-coloured maps (see Cartography) recorded everything then known about Canadian geology. Created by William Logan for the Geological Survey of Canada in 1864. Logan compiled the first major collection of Canadian mineral samples for the Crystal Palace Exhibition in London, England, in 1851, and the Universal Exposition in Paris, France, in 1855. The Survey collections stimulated considerable international interest in Canadian minerals and brought Logan several awards from governments and scientific organizations throughout Western Europe. Perhaps the most historically significant element in the expansive Canadian display in Paris was a sample of asphalt (a mixture of bitumen and gravel) from the International Mining and Manufacturing Company — headquartered in Enniskillen Township in Southern Ontario, and the first oil company established in North America. Brothers Henry and Charles Nelson Tripp had originally been motivated to establish the business after reading Hunt’s reports of oil and bitumen deposits in the township in 1850. Following the 1855 Exposition, the Tripps were hired to help pave the streets of Paris. The company went bankrupt before it could deliver the required asphalt, but the deal nonetheless demonstrated the instrumental role of the Survey in promoting Canada’s early oil industry. The Confederation of Canada in 1867 increased the Survey’s geographic area of operations with the addition of vast tracts of uncharted land in the west and north. Ottawa then moved quickly to claim the western territories, bringing the provinces of Manitoba and British Columbia	into Confederation in 1870 and 1871, respectively, and further expanding the Survey’s purview. 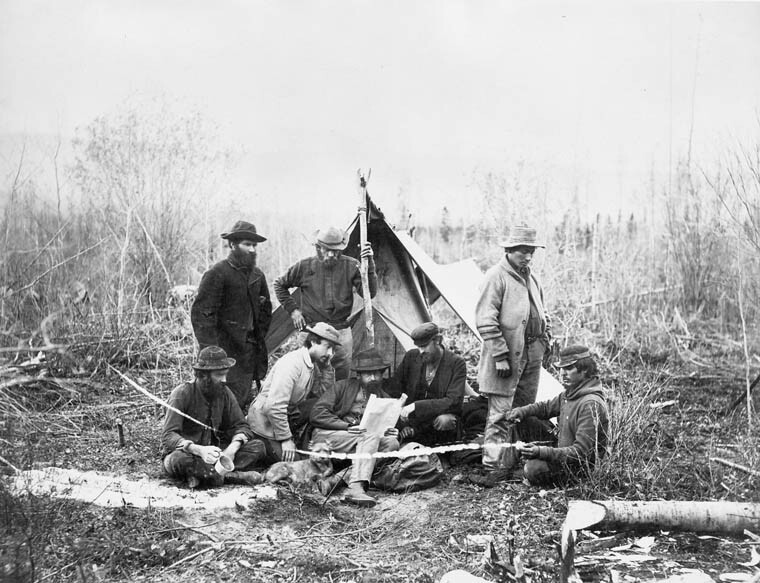 A Geological Survey of Canada survey party in Canoe River, BC on 14 October 1871. Geologist Alfred Selwyn is at centre, John Hammond is on his right and Benjamin Baltzly on his left. As Ottawa began planning the construction of the Canadian Pacific Railway — which would run from Lake Nipissing , Ontario to coastal British Columbia — the Survey was ordered to explore the western territories and chart the railway’s route. This task was initially undertaken by Alfred Selwyn, an English-born geologist who had worked as the Director of the Geological Survey of Victoria, in Australia, and succeeded Logan as Director of the GSC in 1869. Selwyn conducted explorations of the interior of BC — mostly by canoe and horseback — in 1871 and 1875. As a result of expeditions conducted by George Mercer Dawson, the Survey’s maps of BC, the Yukon and Alberta became increasingly detailed. Dawson went on to become Director from 1895 to 1901. Work on the CPR route was also conducted by Robert Bell. Bell initially joined the Survey in December 1856 and only retired from it 1908, having charted the coasts of Hudson Strait	and Hudson Bay, reported on the ecology of the Saguenay region, and worked as acting director. As the Survey’s work gained increasing appreciation on Parliament Hill, it received permanent status and a promise of continued funding in 1877. Four years later, its headquarters were moved from Montréal to Ottawa. In the subsequent years, as settlement expanded and Ottawa consolidated its control over the countryside, the Survey’s geologists made a number of other landmark discoveries that have had a lasting impact on Canada’s regional economies. In the 1880s, J.B. Tyrrell made major dinosaur fossil and coal discoveries in Alberta and explored the uncharted wilderness of the tundra	northwest of Hudson Bay. Beginning in 1892, A.P. Low’s work in central Labrador and the Ungava Peninsula	revealed the region’s vast iron resources, which would later be mined throughout the 20th century. His surveys of the area would later be used to settle the Labrador Boundary Dispute.In 1903–04, Low commanded the government expedition to northern waters in the Neptune, in a voyage that was Canada's first clear exercise of authority over the Arctic Archipelago. The early years of the 20th century saw a curtailment of Survey operations as budgets were cut and staff were raided by industry or left to join the First World War. Studies with a strong economic focus continued and became even more pressing as Canada entered the Great Depression. The situation changed dramatically in 1935 with a massive one-year public works scheme aimed at generating employment and stimulating the economy. The Survey received $1 million for the field season — 10 times the amount originally budgeted. While creating some logistical difficulties, the extra funding had tremendous benefits for the institution. Field mapping increased tenfold, valuable new data were obtained, and the Survey was able for the first time to make substantial use of aircraft. The Second World War brought new priorities, particularly the search for domestic sources of strategic metals and minerals. One of the most significant and direct consequences of the war was a new business in uranium mining. In 1930, a prospector named Gilbert LaBine had found uranium deposits along the shores of Great Bear Lake, thanks largely to reports published by the Survey 30 years earlier. Following the war, the provinces’ growing investments in nuclear energy encouraged the Survey to explore the Canadian Shield	for deposits of uranium — a project that resulted in unprecedented mapping of the Shield. In 1947, a landmark oil strike at Leduc, Alberta, marked the beginning of Western Canada's oil boom and an unprecedented demand for geological information about the region. The 1950s and 1960s were a time of rapid technological development in Canada, and the Survey benefitted tremendously during these years from Ottawa’s growing willingness to fund scientific research and development. Under the leadership of G. Hanson and J.M. Harrison, directors from 1953 to 1956 and 1956 to 1964 respectively, the Survey's field work became more far-reaching and brought together teams of scientists from many geoscience specialties. Aerial photography improved significantly during this time period, as the Survey made increasing use of helicopters. A study conducted by C.S. Lord, chief geologist, showed that in the six years from 1952 to 1958, the Survey had mapped about half as much of Canada at a reconnaissance scale as had been mapped in the previous 110 years, due mainly to the helicopter. Beginning in 1947, the Survey also began making extensive use of aeromagnetic survey technology. This involves mounting a magnetometer to an aircraft — typically a helicopter — in order to identify the mineral composition of the Earth’s upper crust. The technique enabled surveyors to identify deposits of iron ore and uranium, and would later assist them in identifying hydrocarbon deposits as well. The Survey also mounted air-supported, multidisciplinary reconnaissance operations in the Far North during this time period. The most ambitious was the 1955 “Operation Franklin,” headed by Y.O. Fortier, who later became director of the Survey. The 28-person expedition, in a single field season, studied strategic locations and mapped almost 260,000 km2 of the High Arctic. The results of the work triggered industry interest in northern oil and gas exploration. In 1966, the Survey became part of a new Department of Energy, Mines and Resources, which had a mandate for national energy planning and required quantitative estimates of Canada’s reserves of oil and gas, coal and uranium. To provide this information, the Survey developed new methods of resource appraisal that are now internationally recognized and utilized. Working with other agencies, the Survey also provided estimates of the national reserves of nickel, copper, zinc, lead, molybdenum	and iron ore.
By the 1970s, Survey research had a strong environmental and land use focus. 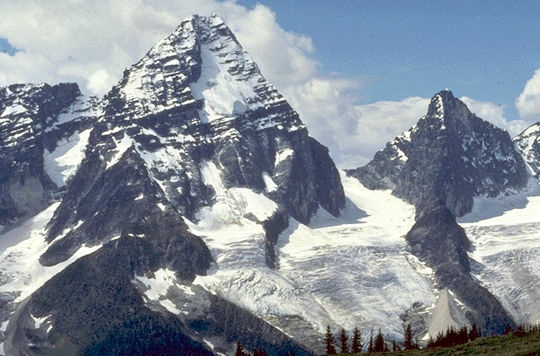 A major program carried out environmental impact assessments of large-scale developments such as the proposed Mackenzie Valley Pipeline. International debates on the ownership of the oceans’ resources required geoscientific information from the Survey to support Canada’s claims to an offshore “economic zone.” The extension of Canada’s offshore boundaries to 371 km (200 nautical miles) from the coast (or beyond, to the edge of the continental shelf) increased the Survey's already extensive 10 million km2area of operations by approximately 40 per cent, and led to an expansion of its offshore research capabilities. In the 1980s, in response to growing concerns for the security of energy supplies and indications that the offshore and Arctic frontiers contained valuable new resources, the Survey established a knowledge base from which the oil and gas potential of these regions could be determined. This work was carried out under the Frontier Geoscience Program. Following a series of studies of the ocean floor, the Survey led efforts to secure Canada’s membership in the international Ocean Drilling Program in 1984. Studies undertaken by scientists from member nations produced new insights into the geological processes at work within the ocean floor, as well as better ways to identify its mineral and energy resources. Also in 1984, the Survey established the Lithoprobe, the largest geoscientific research program ever undertaken in Canada. This program, using new seismic exploration and geophysical data processing techniques, allowed scientists to map the Earth to depths of up to 50 km. Besides providing new information about the planet’s structure, Lithoprobe contributed to mineral and energy exploration, as well as assessments of earthquake	risk and volcanic activity. By the time the program ended in 2005, it had employed over 1,000 scientists and produced approximately 1,500 publications. 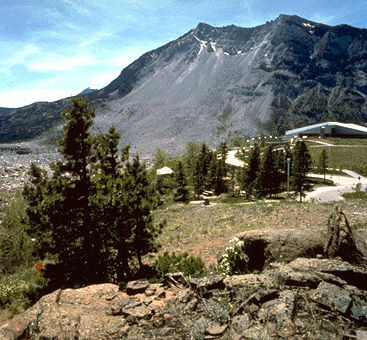 In 1986, the Earth Physics Branch of Energy, Mines and Resources was merged with the Survey. This group was the direct descendent of the Dominion Observatories, and it brought to the Survey a major geophysical arm which includes Canada-wide seismology and geomagnetic observatory networks. Also during the 1980s, the Survey increasingly began contributing to geological research programs internationally. Working with Canadian International Development Agency, the Survey sponsored aeromagnetic surveys in Brazil, Cameroon, Guyana, Ivory Coast, Niger, Burkina Faso, Rwanda, Zimbabwe, Pakistan, and Thailand. In the early 1990s, the Survey took a leading role in developing a new National Geoscience Mapping Program (NATMAP), a cooperative effort involving federal, provincial and territorial surveys as well as Canadian universities, private industry and other interested groups. Its aim is to maximize the impact of funding available for new mapping of the bedrock and surficial geology of Canada by coordinating the activities of participating agencies. The Survey's environmental work now looks at climate change, natural radioactivity and hydrogeology, and establishes baseline geochemical profiles of naturally occurring substances. Through a wide range of research into such natural hazards such as earthquakes, landslides, magnetic storms, volcanoes, tsunamis, floods and ground instability, the Survey contributes to a better understanding of how the environment affects humans, and how humans affect the environment. The results contribute to building standards and emergency planning measures. As part of a reorganization in the mid-1990s, the Survey became a part of the Earth Sciences sector of Natural Resources Canada (NRCan). In 2017, it was again moved, this time from the Earth Sciences division to the Lands and Minerals sector of NRCan. Within NRCan, its mandate is defined by several priorities, including the development of Canada’s mineral, hydrocarbon and water resources; environmental protection; management of natural and geological hazards; and technological innovation. A variety of programs within the Survey continue to explore and map deposits of minerals and hydrocarbons. Much exploratory work remains to be done on seafloors surrounding Canada’s coasts, which scientists have only begun to map comprehensively. The Survey is also exploring the scope of Canada’s shale gas deposits, and assessing their viability as a contributor to the energy industry. Following its joint mandate of promoting environmental protection and sustainable development, the Survey also conducts environmental impact assessments, and provides reports that advise the federal government on effective regulatory policy. In the fields of natural and geological hazards, the Survey operates the Canadian Hazard Information Service and Public Safety Geoscience — programs that conduct risk assessment and emergency planning for natural disasters such as flooding and earthquakes. Finally, its engagement in technological innovation is primarily related to its investments in new mapping and communications methods. C. Vodden, No Stone Unturned (1992). R.G. Blackadar, The Geological Survey of Canada: Past and Present (1986). Alice WilsonRead more about Alice Wilson, Canada’s first female geologist and a member of the Geological Survey of Canada. Geological Survey of CanadaLearn more about the survey from its website. GSC HistoryIn celebration of its 175th anniversary, the Geological Survey of Canada gathered 175 objects representing its history, including maps and photographs, and created an online gallery.